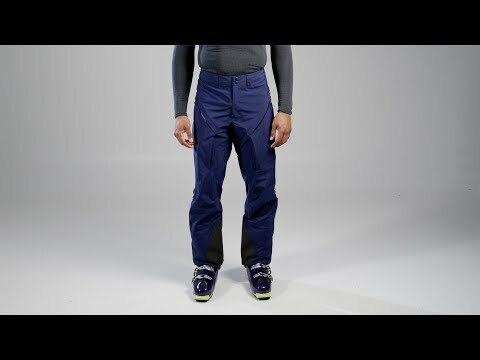 All-mountain hard shell pants with waterproof-breathable versatility for experience-hungry skiers. Breathable 3-layer fabric makes these "the" choice for backcountry days that might serve up sleet delivered on a bed of Arctic wind. A minimalist design keeps the weight down so you can move fast to outpace the worst of the weather. Made of supple GORE-TEX® fabric that offers excellent breathability and withstands full-on weather and rough terrain. Front fly with snaps and a water-resistant Uretek coated zip. Front pockets have coated, water-resistant zips and hidden bellows for added volume. Right pocket has an internal mesh pocket that holds large smart phones. Articulated knees for a full range of motion. Thigh vents with water resistant zips let you dump heat on the uptrack. Insteps have burly polyester and Kevlar kick patches. Hem is shock cord adjustable. Internal gaiters have silicone gripper elastic to keep them in place and a pull tab for easy ski to walk mode transitions while wearing gloves. Built-in Recco® Rescue System reflector allows ski patrol and mountain rescue teams to detect and locate Recco reflectors under snow. Recco technology is not a substitute for avalanche skills training, beacons, essential gear, or smart decision-making in the backcountry.